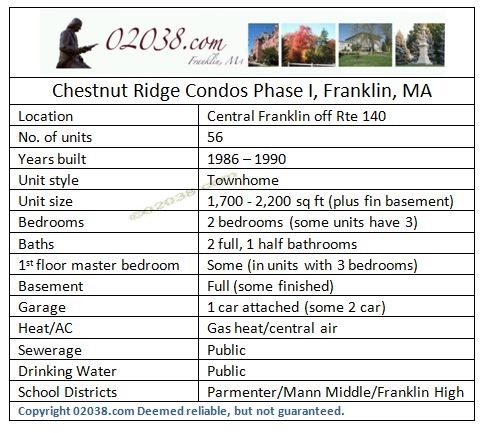 Chestnut Ridge is a townhouse condominium community in the Town of Franklin, MA. Built in two phases, Chestnut Ridge has over 130 homes. 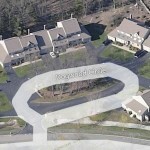 Phase I of the Chestnut Ridge Condominiums (Chestnut Ridge I) has 56 townhomes and was built between 1986 and 1990. Townhomes at Chestnut Ridge I range in size between 1,700 and 2,200 sq ft living area (exclusive of finished basement space). Most have 2 bedrooms and 2.5 baths. Some have 3bedrooms; these homes have first floor master bedrooms. All homes in Chestnut Ridge I have vinyl siding with stone veneer facades, gas heat, fireplace, basements, and at least one car garages. Many of the homes in Chestnut Ridge I are clustered around cul-de-sacs. This reduces drive-by traffic noise and fosters a sense of peacefulness and privacy. 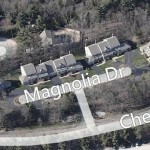 Magnolia Drive, Dogwood Circle, Applewood Lane, and Cherrywood Lane are some of the street names used for these cul-de-sacs. Another important benefit offered by Chestnut Ridge I is fact that homes there are open to all age groups; Chestnut Ridge I is not restricted to buyers age 55+. Follow the hotlink to learn about Phase II of Chestnut Ridge. 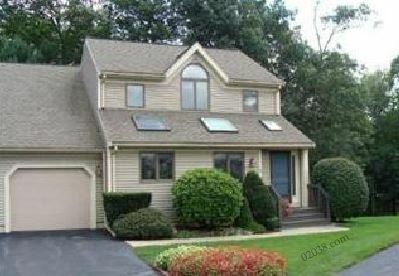 You can see all condos for sale in Franklin, MA here. 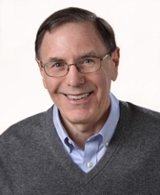 Contact Warren to get inside any condo for sale in Franklin; he knows the Franklin condo market very well!